GRAVE DIGGER, along with bands like RUNNING WILD, RAGE, SINNER and early HELLOWEEN spearheaded the Teutonic Metal scene in Germany in the early eighties. The title track from their iconic debut Heavy Metal Breakdown, as well as “Headbanging Man” were some the first anthems showcased in this groundbreaking new era of metal. Charismatic frontman Chris Boltendahl, core and figurehead of the band since the very beginning left his mark with his unique vocal style on each and every release since. This new compilation, Exhumation - The Early Years, presents a new take on the band's classic recordings in a wistful look back to the eighties. 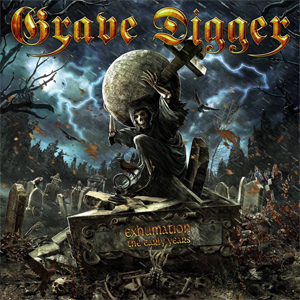 Focusing beyond their debut and subsequent hit albums like Witch Hunter and War Games, with new takes on classic favorites such as “Shoot Her Down” the unforgettable opening track from the first GRAVE DIGGER demo from 1982. Also included is “Stand Up And Rock” from 1987's Stronger Than Ever, which was released under the cross-over attempted band name DIGGER (now a rare and highly sought after edition). In addition, the release includes "My Private Hell Morning" and "Young And Dangerous" two bonus tracks and the first new songs since last year's Return Of The Reaper teasing what is to come from the band's upcoming 2016 new studio album! The album is set to be released worldwide on October, 23rd and today the band has now debuted the official video for “Heavy Metal Breakdown”. Check out the clip by Juppi Juppsen on KNAC.COM now right HERE. 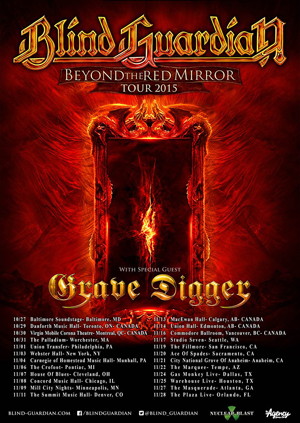 Catch GRAVE DIGGER live on the road when supporting German power metal giants BLIND GUARDIAN on an extensive US-tour this fall and some very special birthday shows in Germany.